ML2OH is the EOS Aura Microwave Limb Sounder (MLS) standard product for hydroxyl derived from radiances measured by the THz radiometer. The data version is 3.3/3.4. 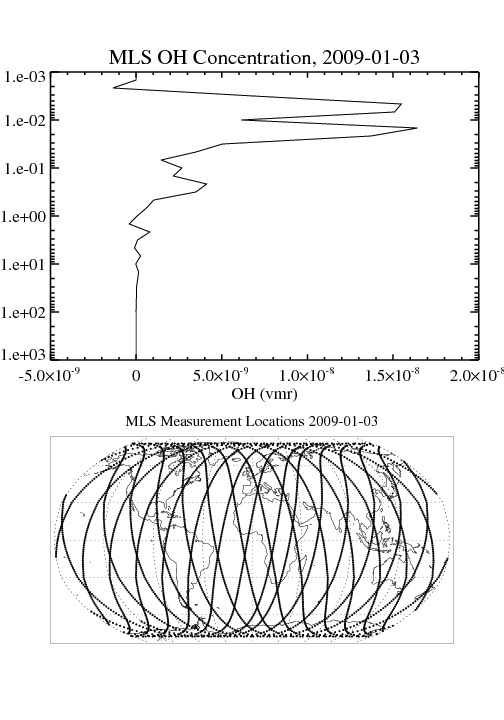 Data coverage is continuous from August 8, 2004 to December 12, 2009 when the THz radiometer was placed in standby mode. After this date OH data were collected for about 30 days in August/September of 2011, 2012, 2013 and 2014. Spatial coverage is near-global (-82 degrees to +82 degrees latitude), with each profile spaced 1.5 degrees or ~165 km along the orbit track (roughly 15 orbits per day). The recommended useful vertical range is from 31.6 to 0.00316 hPa, and the vertical resolution is about 3. Users of the ML2OH data product should read section 3.18 of the EOS MLS Level 2 Version 3.3 and 3.4 Quality Document for more information. The data are stored in the version 5 EOS Hierarchical Data Format (HDF-EOS5), which is based on the version 5 Hierarchical Data Format, or HDF-5. Each file contains two swath objects (profile and column data), each with a set of data and geolocation fields, swath attributes, and metadata.